You have made me endless, such is your pleasure. This frail vessel you empty again and again, and fill it ever with fresh life. This little flute of a reed you have carried over hills and dales, and have breathed through it melodies eternally new. At the immortal touch of your hands my little heart loses its limits in joy and gives birth to utterance ineffable. Your infinite gifts come to me only on these very small hands of mine. Ages pass, and still you pour, and still there is room to fill. These words of Tagore, cherished by Pat, beautifully exemplify her life – a woman steeped in faith, joy and love which she shared with all. Less than twenty-four hours before she died suddenly and unexpectedly in the Assisted Care Facility of the Maryknoll Sisters Center on June 24, 2002 she traveled to Schenectady, New York with Sisters Dorothea Hudert, Margaret Monroe, and Claris Zvareva to give a Mission Promotion talk at Our Lady of Fatima Church. Pat’s reflection began with her describing how the Gospel passage spoke of the Pascal Mystery full of paradoxes – darkness/light; whispered/proclaimed; dying/rising. Then after sharing her experiences with the street children in Nairobi, Kenya and how the children often expressed their feeling of being treated like half a person, she emphasized the importance of meeting each person as Jesus did, making others feel whole and giving light to the darkness and hope to the hopeless. Mary Patricia Cain was born in Washington, D.C. March 11, 1932, the fourth child and first daughter of Fendall and Mary Slattery Cain. She attended St. Anthony’s Grammar School and graduated from the Academy of Notre Dame, Washington, D.C. in 1950 and the following year, on February 1, 1951, entered Maryknoll at Valley Park, Missouri. 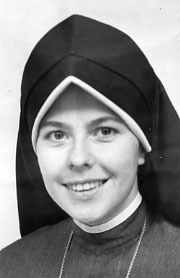 She made her First Profession of Vows in Valley Park on September 8, 1953 and her Final Profession on the same date three years later in Tanzania, Africa. Pat returned to Africa and began a new secondary school in Kenya, focusing on higher education as requested by the parents and School Committee. When the school achieved a successful pass rate and the Maryknoll Sisters turned it over to Kenyan teachers, Pat began working with street children in Nairobi, Kenya. She was a bridge between the street children and the world of academia and used her creative talents in devising a syllabus and teaching methods suitable for all and which captured the hearts and ambitions of her students. Pat also spent a period with nomads in the Northern Kenyan Desert training leaders in marketing, literacy, community-based health, and the use of solar ovens. She said “Here where life was so hard, I learned about the suffering of the poor in a new way.” She then went to Tanzania where she taught literacy to Masai boys who never had the opportunity to study, and to very young married women. In the short space of time that we have known Pat, she has been a source of nourishment and strength and support to us. So many times and so many ways she has made life so much nicer. She brought to our Chapter her sharing of Christ’s mission as lived out in her life. Pat, being a well-balanced person, also took advantage of the opportunity to pursue her love for poetry and art. She enjoyed playing bridge and was an avid sports fan who could always be seen rooting for her favorite teams. Last month Pat was in Oaxaca, Mexico with Sister Mary Malharek practicing Spanish. She was delighted with the experience, returned with enthusiasm and joy, and was eager to share with all stories of her time in Oaxaca. On June 15th she wrote to Sister Jean Maloney in Korea telling her about her days in Oaxaca and ended her letter with these words: “So I am back and looking for a place out of the Center to go and work with Spanish speaking peoples. Please pray I will find a good spot for me.” Little did she or we imagine that God would so quickly answer her prayer and find a “good spot” for her. All that we can know about those we have loved and lost is that they would wish us to remember them as being essential in some measure to our life. The highest tribute to them is not grief but gratitude. We also welcome and thank our Maryknoll brother, Father Thomas McDonnell, for being with us today and for presiding at this Eucharistic Celebration of Christian Burial as we celebrate with thanksgiving and joy the gift Pat has been in all our lives.